NY Inslanders: Captain John Tavares got the Islanders off to a strong start on a power play goal in the first period. The game would be tied at the 15:54 mark, later on in the period, on a Saku Koivu goal for the Ducks. The goal would be reviewed after the net was knocked off its bearings, but would ultimately be allowed. Following a faceoff in the Ducks zone, in the second period, Thomas Vanek found the puck rolling right to him and put a wrist shot past Anaheim goalie Jonas Hiller to regain the lead for the Islanders at 2-1. Center Andrew Cogliano tied the game once again at 2, after his goal 12:41 into the second period. From this point of the game forward, it would be all Ducks. 22-year-old defenseman Cam Fowler scored a miraculous short-handed goal, while teammates Dustin Penner (roughing) and Corey Perry (interference) were sitting in the penalty box, each with two-minute minors. Immediately after the pair returned to the ice, Perry dashed right to the net and scored from his knees with 1.7 seconds left in the second period. He would tack on his 20th goal of the season in the third period, scoring a power-play goal to give the Ducks their final goal, in an eventual 5-2 win. Perry is second in the league in goals and has reached the 20 goal plateau for the sixth time in his career. 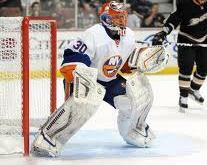 As for the Islanders, they are now 0-3 on their West Coast road trip and have lost 10 in a row. They resume play tonight against the San Jose Sharks. The puck will hit the ice at 10:30 pm. Notes: The Islanders placed Pierre-Marc Bouchard on waivers prior to the game against the Ducks. According to reports, the move is believed to have been made to make space for American Hockey League (AHL) leading goal-scorer Ryan Strome. 2 Stars- Cam Fowler- Scores a short-handed goal to give his team the lead for good and adds two assists on top of that. Solid effort. 1 Star- Corey Perry- Second in goals scored in the entire NHL, after his two goal game against the Islanders.